The recent deluge of new CPUs from both Intel and AMD has paved the way for a refreshed generation of many-core PCs. Users still rocking dual- or quad-core machines finally have a genuine reason to upgrade, and system integrators are quickly updating their portfolio with powerful rigs touting anywhere between six and 18 cores. It's easy to get carried away, mind, and while the likes of Core X and Ryzen Threadripper are admittedly droolworthy, there are sensible ways of upping your core count without breaking the bank. Scan Computers reckons the hexa-core Intel Core i5-8600K is a solid bet, particularly when allied to Nvidia's new GeForce GTX 1070 Ti, and that particular combination serves as the foundation for the firm's 3XS Z370 Vengeance Q base unit. Priced at £1,700, the 3XS Z370 Vengeance Q at first glance doesn't appear to live up to its billing. For a gaming rig at this price point it comes across as, well, somewhat bland, but that's actually kind of the point. Appreciating our penchant for near-silent PCs, Scan claims to have engineered the Vengeance Q to be "as quiet as possible." We don't remember the last time we saw a mid-tower gaming rig without RGB LEDs and some form of jazzy adornment, be it tempered glass or plastic accents, but Vengeance Q's simple, modest appearance is a welcome change. Scan's chassis of choice should look familiar - it's a Fractal Design Define C from 2016 - and though it lacks front-facing USB Type-C, it has the benefit of being reasonably petite at 210mm (W) x 454mm (H) x 415mm (D) in size. There's no side window, with Scan instead opting for the standard case with sound-dampened panels, so we need to step inside to see what's what. Once again, the system is alarmingly simple in appearance. 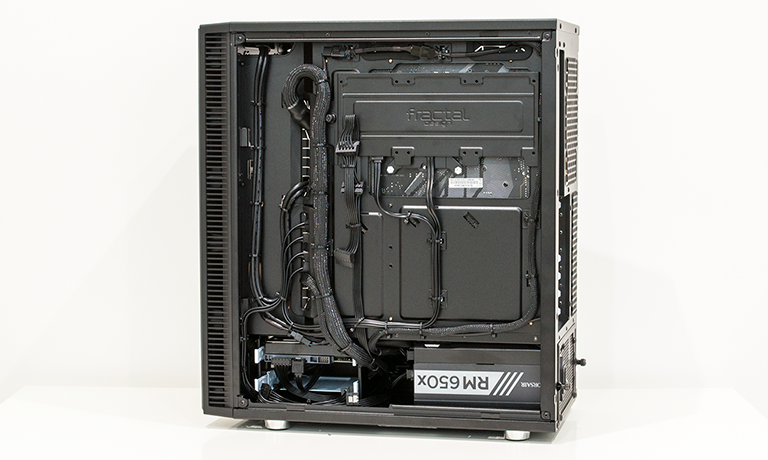 The motherboard isn't attempting to mimic a Christmas tree, there's no liquid cooling and the colour scheme is a mash-up of black, red, silver, brown and beige. 3XS Z370 Vengeance Q isn't a looker, but you shouldn't judge a book by its cover. What we have here is a well balanced set of components, including an Asus RoG Strix Z370-H Gaming motherboard, an Intel Core i5-8600K processor, 16GB of Corsair Vengeance DDR4-3000 memory, MSI GeForce GTX 1070 Ti Gaming graphics, a 250GB Samsung 960 Evo SSD, a 2TB WD HDD and a 650W Corsair RMx power supply. At this price point we're struggling to think of a component we'd want to change, and Scan has put some extra thought into the build with a sprinkle of niceties. 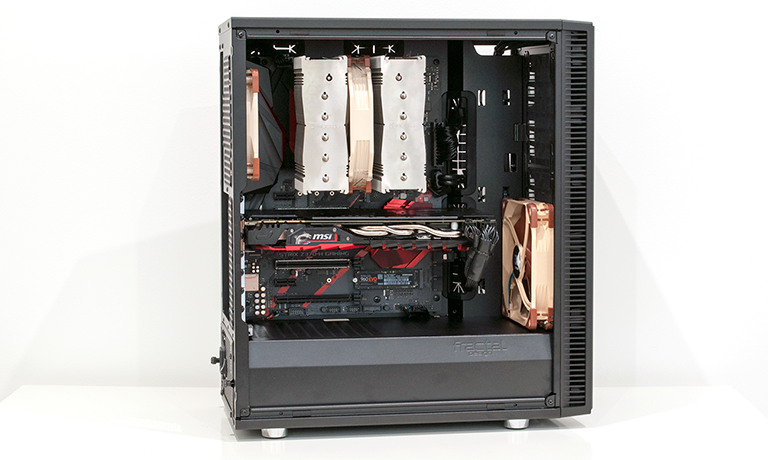 The chassis' default fans, for example, have been swapped in favour of a quieter Noctua NF 140mm intake and 120mm exhaust, and the MSI graphics card has been chosen having exhibited the least amount of electrical noise during Scan's internal testing. Overclocks are of course present, but these too have been reined in. 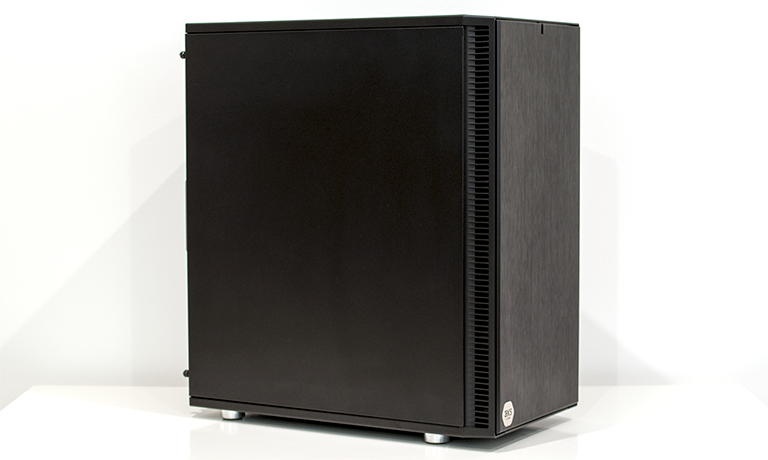 The CPU is shipped at 4.8GHz across all six cores (5.0GHz was deemed to have upset the noise profile) and a Noctua NH-D15S cooler should easily handle the load. On the GPU front, Scan increases MSI's boost clock from 1,683MHz to 1,808MHz, while memory climbs from 8Gbps to 8.7Gbps, which is enough, we reckon, to put the GTX 1070 Ti right on the heels of a dearer GTX 1080. It's a sign of our age that we prefer this mundane-looking rig over some of the conspicuous systems that have passed through our labs. Cable management is very tidy, there's zero bloatware on the 64-bit install of Windows 10, and there's enough room for upgrades further down the line. Such is the machine's simplicity that it begs the question; couldn't you just build it yourself? The answer is most likely yes, however a quick scout around popular retailers suggests that you would do well to acquire all of the aforementioned components for less than £1,650. That means Scan is taking an aggressive stance on pricing, charging only a small premium for a turnkey rig with guaranteed CPU and GPU overclocks, as well as a three-year warranty from a reputable UK firm. No brainer? Let's see what the benchmarks have to say.